Seal Island, off the coast of South Africa, is home to tens of thousands of seals - and the great white sharks that hunt them. We join PhD student Alta De Vos, as she tries to unravel some mysteries surrounding Seal Island. 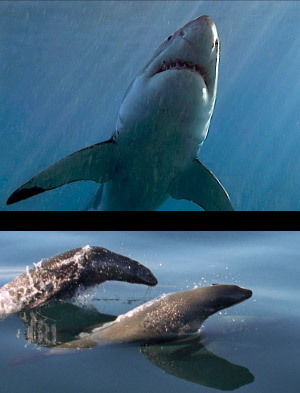 What tactics do the sharks employ to ambush the seals as they head out to feed, and what should the seals be doing as a counter strategy to avoid the great whites' jaws? DVD available worldwide except USA and Canada. Awards: CINE Golden Eagle Award, Spring 2009, Environment and Natural Science; Sixth Waga Brothers International Festival of Nature Films, Warsaw Poland, 2009; XVII. International Festival of Mountain Films Poprad, Slovakia, 2009, Nominated. A dragon hatched from the volcanic furnaces of Gondwanaland. Ancient almost beyond comprehension, yet a living thing. And vast, stretching across a subcontinent, its spine arching above the clouds...No lucky dragon, this. Starvation festers beneath the shimmering green of its skin. But to the creatures that live along its flanks, it can be a bountiful provider as well as a remorseless destroyer. Today we call it the Drakensberg, or "Dragon Mountain". 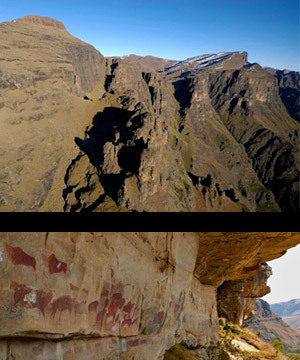 "Drakensberg" is a dynamic documentary journey through the life of this ever-astonishing mountain. It is also a story of animal survival in a landscape of overwhelming, pitiless power. 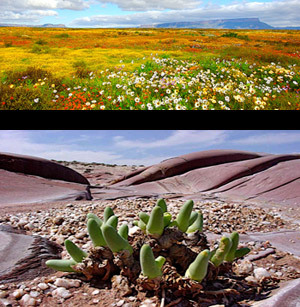 Namaqualand - the setting for an annual wildlife fairytale. After the bewitching rites of spring: seduction, pollination and predation, the inhabitants of Namaqualand must retreat before the curse of the unrelenting heat and thirst of summer. This film chronicles the magical transformation of a landscape - from the fantasy of a field of flowers to the harsh realities of a desert. Some flee or retreat underground into burrows or bulbs, while others fall into the deep sleep of dormancy, only awakening again to the soft touch of winter rain. Born into a family torn with rivalry, a young baboon must confront a host of hardships with only his tenacity and the bonds of friendship to protect him. 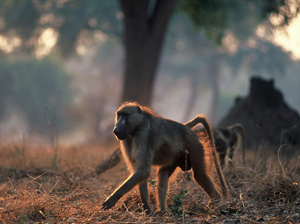 After surviving the overthrow of his father, the murder of his twin sister, the onslaught of drought and the constant threat of predators, the small baboon faces his most difficult challenge when he becomes a threat to the alpha male. A remarkable journey, The Zambezi Troop highlights the social manoeuvring and intrigue found in a complex society of intelligent primates. Drawn by relentless thirst into a steep gorge, animals gather at a life-giving spring. But in this wild coliseum, lions wait in the wings, and the beasts become unwilling gladiators in mortal combat. Two filmmakers, Philip & Lynne Richardson, forsake the safety of vehicles to get close to the action - sometimes too close for comfort! But here, the rewards transcend the risks for those who dare to walk with lions. Also in this episode: Living with Lions. NATIONAL GEOGRAPHIC EXPLORER steps behind the scenes with husband-and-wife film-making team, Lynne and Philip Richardson, as they chronicle the lives of a pride of lions and the drama that unfolds around the spring. At Mana Pools on the banks of the Zambezi River in northern Zimbabwe, the wildlife is faced with a dilemma between satisfying their need for food and their quest for water. As the long, dry summer progresses the white acacias on the floodplain come to the rescue by producing pods for the animals. But, baboons and elephants are the only ones able to reach the pods. The bulls shake the trees, dropping the pods for all to feast on, and large herds of buffalo, impala and eland follow in their trail. But as the drought tightens its grip, even the pods disappear, and animals face the struggle of going inland in search of food or staying at the Zambezi - the last source of water. Then, at last, the rains arrive, the river swells and pools fill - for a brief moment birds fish, catfish walk from the river, crossing land to breed in the pools. 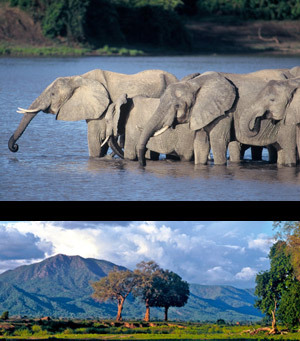 Once again the animals of Mana flourish in one of Africa's most spectacular Edens. 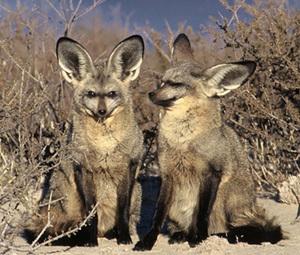 This film tells the story of Flash, a bouncy bat-eared fox cub who grows up in the southern Kalahari desert. Guided by her ever-protective father and the close ties with their burrow neighbours (meerkats, ground squirrels and Cape foxes) Flash braves the hardships of desert-life - heat, drought and predators. But, when the rains bring relief and the desert transforms, Flash takes on life with new hope. It's a story filled with true-life experiences and heart warming moments. 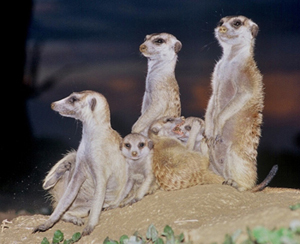 This is a story about a family of meerkats living in the Kalahari Desert. Faced with the worst drought in living memory, the close-knit group must tread the fine line between fending for themselves and co-operating with the rest of the group. Following the story of the youngest male, Little Boy, this dynasty of meerkats slowly declines at the hands of various predators and the lack of food in this hostile desert. Ultimately, it is only Little Boy that survives the hardships, and the tragic tale ends with him joining, and earning the right to mate within, another family along the dry Nossob riverbed. A six-part adventure series covering diving, white-water rafting, canoeing, fishing, windsurfing and waterskiing in the Ultimate Water Adventure. A six part travelogue series covering Malawi, Ghana, Botswana, Namibia, Mozambique and Zimbabwe. A six part series of inserts promoting an international fund-raising campaign for children in Africa. A fifteen minute insert on the first family herd of elephants to be translocated by road cross-border from Gonarezhou in Zimbabwe to Madikwe in South Africa for international distribution. A half-hour programme commissioned by MNet for World Environment Day, sponsored by Nedbank. 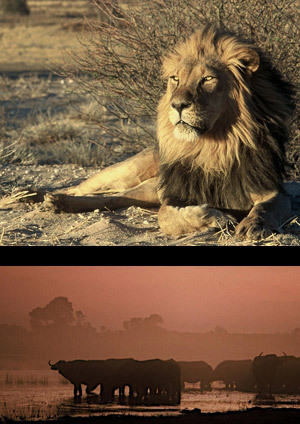 An insert discussing the impact of elephants on this famous game reserve in Botswana. An insert for the environmental programme 50/50, about the only mammal with scales - the pangolin.